The extraordinary beauty of a diamond hinges on a number of attributes. A diamond is a complex stone with each feature contributing to its overall brilliance and beauty. Because diamonds are valued according to their attributes, it is essential to learn about the four C's of diamond features namely, Cut, Clarity, Color, and Carat Weight. Cut is the most important attribute to consider when purchasing a diamond. Diamond cut is not just about the stone's shape. Rather, it is a representation of how much light the diamond stone reflects back to the viewer. In essence, the cut of a diamond defines the precious diamond’s fire. A diamond that is well-cut has a very brilliant and fiery appearance. Diamonds that have substandard cuts reflect a dull and lifeless appearance. Diamond cut also positively contributes to the stone's appearance by making its diameter larger when compared to other stones with the same carat weight. Well-cut diamonds exude optimum brilliance, dispersion of light and scintillation. A diamond's brilliance is the reflection of the light that enters the stone. It is the light a person sees when looking at a diamond. Dispersion is the separation or breakdown of light into its different spectral rays as it travels inside a diamond. Dispersion defines a stone's fire. Scintillation comprises the different spectral colors that are observed by the naked eye when a diamond is moved back and forth. Buying a diamond signifies an important moment in your life, and we understand that for many it can also be a bit of an intimidating experience. For most people, buying an engagement ring is the first, most important purchase to date. At Coby Madison, we want this experience to be an enjoyable, satisfying one for you. Our friendly, knowledgeable sales team is on hand to provide you with all the information you will need. The best color a diamond could ever have is clear or no color at all. Diamond color grading begins from clear to yellow, with intermediate tinges in between. A diamond's color grade is denoted by letters of the alphabet with a colorless diamond rating a color D. The greater the yellow tinge of the diamond, the closer to letter Z it will be in terms of color grading. Diamonds with a D-F color rating are considered as colorless diamonds. 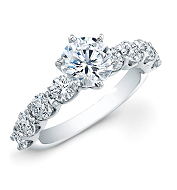 Diamonds with less color are considered more desirable and have a higher value. Stones with G-J color rating are diamonds that appear colorless with its face up but show a slight tinge of yellow when a gemologist views it face down against a white backdrop. Diamonds graded K-Z in terms of color are visibly yellow in hue to the human eye even without magnification or light. Chart illustrates how diamonds are graded according to color by the Gemological Institute of America (GIA).The difference in color between one letter grade to the next is quite small. D-F: Colorless: perfect or almost perfect color. G-J: Near colorless: good to very good color. K-M: Light but noticeable yellow or brown tint. The assessment of a diamond's clarity is done under 10-times magnification. Peering very closely inside a diamond's anatomy may reveal internal flaws or imperfections called inclusions, which affect the stone's beauty and value. Diamond clarity grading is based on the presence or absence of blemishes, impurities or other identifying marks inside a diamond. The presence of flaws or inclusions dampens the brilliance of the diamond because less light is reflected from the diamond. In general, larger-sized inclusions or blemishes affect the stone's brilliance and fire greatly. Flawless - No inclusions or blemishes under 10X magnification. Internally Flawless - No inclusions viewed under 10X magnification, but has some minor blemishes. VVS1 & VVS2 - Very, Very Slightly Included: Very difficult to see the minute inclusions under 10X magnification. VS1 & VS2 - Very Slightly Included: Inclusions are not visible to the unaided eye. Tiny inclusions (small clouds, crystals, or feathers) are visible with 10X magnification. SI1 & SI2 - Slightly Included: Contains inclusions (clouds, included crystals, knots, cavities, & feathers) that are visible under 10X magnification. SI3 - Slightly Included-EGL: SI3 is an EGL grade and is not recognized by GIA or other gemological institutions. It may be graded by GIA as either SI2 or I1. SI3 diamonds do not have any black inclusions or cracks visible to the naked eye, but may have some very minor white inclusions that can be seen with the naked eye. I1, I2, I3 - Included: Inclusions that are obvious under 10X magnification, and visible to the naked eye. Diamonds are weighed in units of a metric carat (ct). One metric carat is just over .007 ounce. One ounce is equal to almost 142 carats. When a diamond weighs over a carat, the weight is expressed in carats and decimals, rounded to the nearest hundredth of a point (i.e. 1.25 ct). The mass or weight of a precious diamond is measured in units called carats. One carat is exactly 200 milligrams. The term "carat" hails from the seeds of a carob tree, which are known to be uniform in size and consistent in weight. The traditional method of measuring the weight of gemstones and diamonds before the 20th century involved the use of these seeds as counterweight. However, with standardization of measurement, one carat unit was pegged at one-fifth of a gram, or 200 milligrams. One important point to keep in mind when considering the carat weight of a diamond is to know that the 'per carat' price increase significantly as a diamond gets larger. For example, we know that all things held equal (same cut, color, clarity) larger stones are worth more than smaller ones. However, many people don't realize that a 2.00 carat diamond is worth more than just twice as much as a 1.00 carat diamond. This is because larger diamonds are rarer than smaller diamonds. The more scarce the diamond is, the more it is worth.